Stylish actress Molly Ringwald chose this name for one of her daughters. Thanks to Melissa for suggesting Adele as Baby Name of the Day. The average elementary school is home to a flock of girls called Maddie. Madison and Madeline both ranked in the US Top 100 for the 2000s. Madelyn was just a few paces behind, and variant spellings abound. In a sign that we’re really not all that good at finding unusual baby names, American parents decided to be just a little bit different. Check out your average nursery school and Maddie has been eclipsed by Addie. In 2009, Addison charted at #12, with Addyson (#226), Adeline (#351), Adalyn (#369), Adelyn (#405), Addisyn (#432), Adelaide (#567), Adalynn (#672), Adyson (#690) and Adelynn (#843) also ranking. You’ll notice that Adele is missing from that list, and indeed, she stands out as a spare but stylish alternative. Adele is sister to Frances or a substitute for Alice, quite distinct from many of the Addie-generating options. And that’s the trick, of course – if you want your Adele to stand out from the crowd, you’ll have to treat her as a nickname-free appellation. Adele does have the feeling of an antique due for restoration. Her most popular years were 1914 and 1915, when she reached #188 in the US. A number of Hollywood starlets wore the name. She left the charts entirely after 1969, and thus far has been exempt from the rebirth of all Ad- names. Adèle is also the French form of the name, and her roots stretch back to the 600s. Saint Adela was a widowed princess who founded a convent outside of modern-day Trier. Like all of the related names, she’s derived from the Germanic element adal – noble. Fred Astaire’s big sister – and fellow dancer – Adele married an English lord and left behind the limelight. More recently, singer Adele Adkins – better known by her first name only – scored the Grammy award for best new artist of 2009. If you majored in math, you might recognize the adele ring. I won’t pretend to have a clue what, precisely, that means, but I was intrigued to learn it is short for additive idele. English lit majors might recognize Adele as the name of Jane Eyre’s charge. Adelle and Adella are sometimes seen, too. Of course, just like Alice and Frances and plenty of spare, 1920s-era appellations now making a comeback, Adele might not be dormant for long. After years of Olivia and Isabella, there’s something quite attractive about the slim Adele. As for Molly’s second daughter, little sister to Mathilda Ereni and twin to Roman Stylianos, I couldn’t find an interview where mom revealed her inspiration. But she did live in France for many years, and in this Mother Jones interview, Molly mentions being a fan of the aforementioned singer. I also spotted a Lilly Pulitzer tee called Adele. Between her potential to share the mega-hit diminutive of the moment and her sleek retro style, Adele might well be back in the mainstream faster than you can say Pretty in Pink. My name is Adele…I never really liked the name but when I say that other people say how original it is. It always had to be spelled until the singer made the name popular. I’m currently VERY pregnant (due yesterday..) with my second, a girl. Adell is my middle name, one that I share with my mom, grandma, and great grandma. I always assumed we’d use it in the middle spot for our daughter, as well, but recently I’ve been considering it as a first. I think it would go really nicely with big brother Arthur! Oh, I think it makes a great first – especially with all that family history! A friend named her daughter Adela a year-ish ago, and I was caught off guard at first as I’d never heard it before. Adeles are rare, but Adelas even more so. However, it’s really grown on me over time. I’m a big fan. They pronounce the name A-dell-a and we often call her Dell or Della. I prefer Adela over Adele– it sounds fresher and snappier to me. I’m on the fence. On the one hand, it’s sweet. On the other hand, it could be my aged aunt. But it goes with Ethan and Samuel well. But I can smell the Chanel No. 5. Back and forth. Maybe I’d be ready for this one in 7 more years. This is timely for me because I was reading a Sookie Stackhouse book recently and kind of paused at the name Adele, though I had read it before. I asked my sister what she thought of the name, but she wasn’t a fan! I do think it’s pretty, but for some reason I tend not to like names that begin with short vowels as much as those starting with snappy consonants (also nixes Eliza for me, which I otherwise like). But I would love to know a little Adele! I adore Adele! There’s something very charming and refreshing about it. It sounds classy, elegant, and down-to-earth all at the same time. I would still like to see Adele on another person’s child, but not my own. I like Adele so much better than all the other Ad- names for girls. I agree that it’s better without defaulting to the nickname Addy too. I think Adele is charming, gentle and graceful, but I love Adela. Probably because I love ‘a’ endings and I had a great-great aunt Adela (nicknamed Della) and it always stood out to me on the family tree as a bit different and intriguing. Little Adele from Jane Eyre is, of course, what first comes to this English major’s mind. I met a teenaged Adele at a summer camp in the ’90s, and when I told my parents that I liked the name they insisted it was a nickname and wasn’t usually given as a full name. I know now that that’s not the case, but a little voice in my head still shouts “nickname” whenever I come across Adele. Adele/Adelle is wonderful! She can also fall in the popular Elle/Ella crowd but still stands out as a full name. 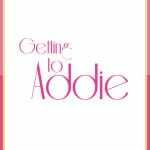 I agree that it’s best without being Addie, or it loses it’s charm. Maybe Della if you really like nicknames. I slightly prefer Adela, though it is a little iffier on pronunciation (ah-dell-uh or ah-day-lah). Unfortunately none of them go well with my last name anyway. Adele is so sweet, soft and romantic. I am surprised it is not more popular. I love Adele! It’s short and kind of unusual, but I don’t see it being out of style for too much longer. Unfornutently I have a boss called Adele, who I’m not too fond of, so it does bring up a bit of dislike on that front. Adele is also the name of the British boss in the recently cancelled show Dollhouse. There were also Adeles on The L Word and True Blood. It’s right outside the top 1000 on the extended SSA list, and I expect that it will rank soon. I really love it, but Addie/Maddie is EVERYWHERE. I really dislike those nicknames now. I’m surprised Adelaide came back before Adele.